This article was published in SuperFord Magazine in 1985. Most of what I wrote still holds true today. Enjoy. I'd like to be able to read it full size, can you change the format for us. I noticed you hanging out on Inliners earlier. It seems that our dyno project over there has generated a lot of interest on other forums for inline magazine articles. Our's too will be in an upcoming article. We need more articles on inlines, maybe this we keep the editors interested and continue. cant read it.....maybe you moonlight as an insurance policy writer?? This should help. Click on thumbnail, then click image for a full size pic. Remember to use your browser's back button to continue. Looks like a STICKY to me! Wow, thanks FTF, I told you you should write a book. Just think how much more you've learned in the almost a quarter of a centry since! I am particularily interested in the in-head studs to support the combustion chamber. I've never seen or heard of anything like that. Very interesting. I assume you preload those to some amount? Is this still a recomended modification? Also of interest is the cam specs. I realize that these are for drag only motors, but they are so far from what most people are using on street vehicles, that I really think a strong street/strip motor could use alot more than the typical. I have a considerable interest in all inline engines but particularly the 240/300 Ford six. I got hooked on it back in 1967 after reading an article on Ak Miller's side draft weber carb'd 300 ci (stroked 240) build up in the "Complete Book of Engines" published by Petersen in that year. I just completed reading your great article (for the 3rd time just to be sure all the details registered) and it just reinforced why I think this engine is such an elegant design and has so much potential. Thanks for the great read and keep up you forum posts as they are extremely important to my ongoing education. PS: Real men drive altereds. Real crazy men drive FUEL altereds! I know. I watched Willie and Sush (and many others) race many times at Lions and OCIR back in the day. The question was never who would win. The real question was which lane they'd be in going through the lights . . . It takes a special type of person to climb into a car with a power-to-weight ratio of 2hp/lb. Even my puny six gets me from 0-to-60 in 2.9 seconds and 0-to-117 in 5.7 seconds - if it goes straight. What a rush for a speed junkie like me. At least you have some wheelbase to help keep you going (relatively) straight. As you obviously know, back in the day, the AA/FA's typically had something like 100" - some even less - with an insanely high center of gravity. But then again, I guess the wheelbase is sort of meaningless when you're carrying the front wheels like the Winged Express would often do at various points going down track. Those were certainly the days . . .
PS: Just to prove you can always learn something new; I've never heard of (much less seen) positioning bolts down through the head to support the combustion chamber below until reading your article. Sounds like something the likes of Ak Miller or Smokey Yunick would come up with. Are you still doing that with your current engines or is that not an issue with your (rare as hens teeth) current cross-flow head? By the way, is there any chance that you may get one of CI's early prototype 240/300 aluminum heads to do some "field testing"? Just curious . . .
Bruce Sizemore clued me in to the head posting technique when we both worked at Ford / Dearborn. I do not use it for my crossflow head but I think it is still a valid option if you run CRs in excess of 12:1, or boost. I would try an aluminum u-flow head on my truck. But on the altered - well, "how ya gonna keep 'em down on the farm after they've seen Paree." So the "head posting" technique came from Bruce Sizemore. Why am I not very surprised! I hope you get a chance to test the CI head when it becomes available. While I understand that a U-head design will never (?) perform to the level of your cross-flow head, it would still be interesting to have someone with your big Ford racing experience see just how far the CI U-head can be taken. Given how rare your X-flow head is, and how technically challenging a "composite" head (like Sizemore's) would be, and how REALLY expensive the AJ/SVO billet race head is, the CI head is likely to be the only cost effective solution for most of us mortals. By the way, have you broken into the 8s yet? Hadn't heard. Well, to be honest, I don't see much of a future for any aftermarket 300 head in view of the fact that I just auctioned off an Aussie aluminum crossflow canted-valve head complete with injection, cast valve cover, etc for $399. That really opened my eyes to how limited the market is. I detuned my race day combination in an effort to contain my head gasket failure issues, which I did, but as a result the car is still running 9.0s. I had intended to take the car out this fall after the points season was done with the motor set back on "kill" when the weather conditions were favorable for running 8s but other pressing projects prevented me from doing that. I also discovered some other tricks I intend to perform on the carbs over the winter which will also help e.t.s. Sure I could strip off some 200 lbs of non-essential hardware like cooling system, parachute, trans cooler, big battery, etc. and theoretically pick up about four tenths and convert to alcohol for another couple of tenths but I'm a bracket racer - I bracket race, and as such I want to drive the car as it will be for racing conditions. I'm assuming the cross-flow head you sold was for the "small" Ford six? I agree that $399 for the head, injectors, and such seems way below a fair market price. But as you say, maybe the market just isn't there. I really hope you're wrong about the potential demand in the 240/300 head but I fear you could be right. If the economy gets better (not really expecting any real improvements any time soon) and CI does deliver a production head, it will be interesting to see if it actually sells well enough to have made the effort worthwhile and profitable. I sure hope so. Running 9-ohs on a "dialed back" motor is still pretty stout and I understand that, as a bracket racer, your need to be consistant and predictable is far more important than to squeeze out the last bit of ET. With our inlines (whether Ford, Chevy, Mopar, GMC, or ???) it's very difficult (and way too expensive) for most of us to compete in "class" racing so bracket racing is the logical place to be. So if I were to field a car at this point, I think I'd be looking at a nostalgia FED or altered running a 240+ Ford. The Inliners D/D[ragster] late stock head and maximum 260ci class on gasoline or alky might be interesting. Of course, bracket racing would be the primary mode of competition as a simple practical matter. I've always been an altered roadster fan (as I'm sure you've guessed) and if I went that route, I'd really like to aim toward a more vintage, old school look: shorter wheelbase (around 95-105") and the vintage '23T body with a wider rear track where the wheel wells don't extend into the turtle deck - something you might have found in the late '60s or early '70s. Probably would have to fabricate one since I doubt anybody is still making the old school body these days. I understand that an old school car would limit potential performance but at this point in life, it's not so much about going really quick and fast as it is about having (affordable) fun and enjoying the company of other racers at the track. ... I understand that an old school car would limit potential performance but at this point in life, it's not so much about going really quick and fast as it is about having (affordable) fun and enjoying the company of other racers at the track. Its funny you should mention that Russ as one of my "pressing projects" is getting all the pieces together to restore my old (1978) Logghe Stamping car, as pictured in the article above. It needs front-halving after an intimate encounter with a concrete guardrail in 2000. I plan to set it up for Nostalgia racing and make it run 10.0hs. That is as fast as is allowed and not have to get the chassis re-certified every couple of years - a hassle I don't need. I hope you get a chance to do a 240 FED or altered old school sometime and feel free to bounce ideas off me if you like. A 240 is practically indestructable and reliable as an anvil. I just wrote a (too) long post regarding the 240 vs 300 inch question and it apparently got lost in the "ether", maybe running into the 'Flyer's most recent post. In any event, I have been under the perhaps mistaken impression that the 240/300 Ford OEM head would not achieve the necessary flow to support a 300+ ci race motor spinning at (say) 7500 RPM. From what the "calculators" say, the head would need to have an intake flow of just over 302 cfm. I didn't think you could get there but given CNC-Dudes recent post and the 'Flyer's great article, maybe (in the right hands) such flow is achievable. But my interest specifically in the 240 version of the big Ford was primarily based on the Inliner's D/D[ragster} class rules that limits the displacement to a maximum of 260 ci. There are a number of engines that would be good candidates including the 250 Chevy, the 225 Mopar slant six, the 242/258 AMC/Jeep, and the 240 big Ford. There may be others but they don't come to mind . . .
'Flyer, if I get off dead center on this project, I'm sure I'll have (too) many questions to ask and I appreciate your willingness (as well as others on the inline six forums) to share your experience and expertise. Really enjoyed your article on 240/300 buildup. I am gratified to see that someone of your level of expertise appreciates the 240. With the former AMC 4.0 showing what four litres can do,a Ford 240 can at least match their performance. BTW the combustion chamber roof support was said to date back to the Lincoln Y blocks used in the Pan-American races in Mexico in the 1950's,can neither confirm/deny truth of this "engineering legend" but have seen period photos of these heads w/ support studs in area that eppear to be over c/c roof? As an aside six cylinders of anymake but GM are considered a joke @ most NHRA strips,seem to be more tolerated than appreciated;until they kick-a... on the GM's,then its tear downe time,"ya hadda been cheating"etc,etc. THE FRENCHTOWN FLYER wrote: This article was published in SuperFord Magazine in 1985. Most of what I wrote still holds true today. Enjoy. FTF, is there anything in particular about the 240/300 engines that stick out as not holding true anymore? I'm curious. Thanks for taking your time to call me for the article. I wanted to let you know what was happening. The editor went with a humorous piece involving my 300, but now wants a 'how-to' article on the 300. I still have the notes from our talk, so you will figure prominately in the article. I was wondering if you have any photos of a build in process, showing pistons of a 390, or any other type engine. I will, of course credit you with the photos. A PHOTO OF A CROSS FLOW HEAD WOULD BE THE CROWN AND GLORY OF THE ARTICLE. Hi again. I think the 352 piston is a better choice for the 300. The 390 has a stock bore of 4.050". The 352 has the same 4.000" bore as the 300. If the stock 390 pistons are used then there will be little room to rebore at a later date if cylinder wall damage occurrs. I have a 352 piston we used in the Pinto that my partner cut down using a CNC program that left a dome above the combustion chamber, thereby increasing the compression on this race only engine. For street use just turn .050" off the top of the piston to create a flat top. I think we paid $6 a piece for the cast 352 pistons. I don't have a photo. I will dig the piston out, photograph it and post it. Here's how to do it. Cut out a head chamber. Leave enough stock to save the head bolt bosses. Install the valves you are using. Install the rocker studs you are using. 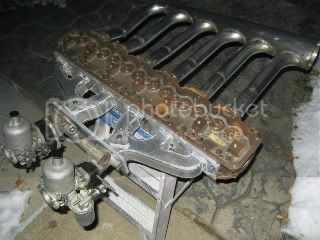 In this case it was a 240 head with 1.94 and 1.60 Chevy valves and screw-in Moroso studs. Install light checking springs. Then using a band saw or Sawzall make cuts through the ports while saving the mounting bolt locations. It may be necessary to chip away the port with a hammer and chizzle. It hurts hi-lift flow numbers. Chev rockers are for use with a stock cam. If you are going to use a different cam that will take the place of using the chev rockers. I would not use both. It is an either/or situation. The rockers are a budget solution for those with a compatible rocker arm & pedestal setup running a stock or equivalent cam. 1 "76" F150 RC, LB, 2WD, 300, NP435, 9" open 3.00, special order 2-76/Delivered 4-76. Still "new". 1 "73-79" F150 RC/SS/SB/4WD, "84"-300, T18, NP205, 9" open 3.50, Dana 44 3.50 open, Offy DP, Holley 470, EFI + single 2.5" exhaust. Gathered from 15+ donor/parts trucks. "Fubar". Runs good, safe, still needs details/project continues. With higher lifts the first limiting factor will probably be valve guide-to-retainer clearance. That assumes you have springs that wont coil bind. Lifts in excess of .600" are possible. On one car with a cam with .6-something lift I am using the 1.75 rockers that puts me over .700" lift. Be sure to check out the FAQ addressing all the clearances you need to address for mods like this. Good luck. Thanks for the info, Ill talk to my machinist about it as well cuz I dont think he's ordered a cam yet and I was wanting soumwhere close to .600 lift. maybe a little less and I gotta get new pushrods anyways so I'll just get them 3/8 pushrods if the Chevy rocker arms will work with them.. How much power could I expect naturally aspirated with .600 lift, bored .040 over, 2.02 intake 1.85 exhaust (or soumwhere around there), a 3 angle job, gasket matched runners, and 8.8 cr? I know that's a lot to account for but you used to race these bad boys right? 62RatRod wrote: ...you used to race these bad boys right? ...still racin' - every summer. Depending on the rest of the build 250 - 350 HP is quite attainable with a .600 lift cam and big valves. Awesome I'm thinking about building my truck for LSR.. There's a guy on another forum that has a bada$$ long bed uni like mine. He ran like 130 at bonneville with a 301ci y block ford. To compete in the class I'd b in if I lift it naturally aspirated I'd have to do soumwhere n the 160s : ... Another quick question, may sound dumb, but it was brought up on another forum I'm on. Is there such thing as a commercial block that has more bore spacing? A guy said he had his 300 bored to into the water jackets then sleeved an re bored to like 4.5 in. To my (somewhat extensive) knowledge there is no such thing as a commercial block with larger bore spacing. The standard bore spacing on all 300 blocks os 4.480 inches, .100" wider than small block Ford V8s. I wouldn't recommend putting 6 sleeves in a block unless you go to the extreme Bob Glidden did with his Cleveland blocks back in the 70's and furnace brazed the tops and bottoms of the sleeves to the blocks. But then you have to remachine all the machined surfaces to get them back square. Just putting sleeves in 2 adjoining cylinders places tremendous stress on the deck, especially with these thinly cast blocks, much less all 6 cylinders. Yea I figured it was too good to be true.. I didn't even wanna bore mine but .020 over cuz of how thin the walls looked but 2 of the cylinders were pitted with rust so he did .040. I wish his daughters still worked there cuz they used to port n polish and I know I don't have the hand eye coordination to do much.. How far down the runners should I go when I try to gasket match them? I have a spare head I can practice on that's from the same year model, I think they're '87 castings.. I wouldn't bother to port match - it is largely a waste of your time. Just be sure there isnt any place the head intake port opening overlaps into the intake manifold runner and the exhaust manifold runner does not overlap into the exhaust port. Sweet my machinist couldnt even tell me where I might find all that and it looks like they have everything I need there. THANKS!!! I love to drive well built engines (while it is bolted into a vehicle of course), but have 0 experience building an engine. IMHO most of what you all talk about escapes me. I am salivating for one of these 300ci to power my 69 Bronco 4x4 for the next 40 years or so. Can you build one complete or recommend someone who can? Currently I am in Afghanistan with the Marines, but from Georgia when I get back onto to U.S. soil. I would love to have an engine with 500+/- torque and whatever hp that comes out to be. I am running the factory 3 speed trans and transfer case, matched .350 front and back in the pumpkins. I am using 33" tires. I am pulling around some extra weight with full roll cage, brush bumpers, tire and fuel carriers, etc. I may change over to a NV3550 or 4500 to get some more favorable gear ratios for low end and highway cruising. I have looked thru the Bronco area for the forums but can't find much as far as reputable crated engine I can have installed. I have seen your name come up across the internet when I search for well built 300's. I would consider it an honor and keepsake engine if I could get one you built for my specs. Would love to have a throttle body injection with a low psi turbo, skipping any ECU or whatever, just good old distributor with throttle body. Hello. Thank you for the kind words. Thanks for serving our country. I do not build any engines as my own projects keep me pretty busy. But two sources I would trust are Performance Machining in Ottawa Lake, Michigan or Muscle Machine in Sorrento Florida. Thanks for the recommendation. Kind words given where credit is due. Iwas able to download your article, and will commit it to memory as I continue my adventures w/ my 1984 f150 4x4. Thank you for sharing. Complete text from the article, I'll follow up with better scans of the images along with their captions after I receive my copy of this issue of Super Ford Magazine. Text and Photos by Greg Koesel. Industry insiders and devoted six cylinder racers generally agree that the 240/300 cubic inch Ford six cylinder engine is one of the most durable inline engines ever made. Introduced in 1964 for use in light trucksand the Ford Galaxies, the engine has plenty of potential for performance applications of all sorts, from drag racing to off road vehicles. The engine has many features which make it suitable for racing -- seven main bearings, four inch bores, and a twelve port head. Forged steel crankshafts and rods were used in the heavy duty 300 inch versions. Another point to consider in this age is that the 300 inch six engines are falling off Ford's Cleveland Engine Plant assembly line as fast as they can build them, ensuring an abundant supply of engines for years to come, while many of the performance V-8 engines were phased out of production years ago. Most of the engines I have built have been used in drag cars but many of the steps I go through in building one of these sixes are used for other applications also. Let me also say now that I have learned a lot by talking with other prominent six cylinder Ford drag racers such as Bob Huettman, Bruce Sizemore and John Peto. They have helped me keep pace with the high technology racing going on in the 80's. I am going to limit the scope of this article to engines using the production type head, because I feel this information will be beneficial to the most people. Those racers who are using hybrid V-8 heads on their 300 cubic inch sixes are pulling close to 600 hp out of them, but how many of us can afford the five figure bank roll needed to set up the hybrid head, induction system, valve train, etc. needed for one of these exotic pieces? No, we'll concentrate on building an engine to put out a reliable three hundred plus horses without having to mortgage the farm. Before you get the impression it is inexpensive to build an engine such as this, it isn't. It will cost about as much as building a small block V-8. But if you like six-bangers you can build a durable powerful racing engine by following the procedures outlined. I'll also touch on that which works well in a street machine and towing and R.V. applications. The engine blocks are virtually all the same, 240 cubic inch engines will accept the 300 crank and vice versa. The early blocks ('64-65) have smaller thrust face on the number of five main bearing insert so check the block for the proper thrust bearing size before ordering new bearings. I prefer to use a used block, but I don't go out of my way to seek out any particular year. All of the blocks have the same cylinder wall thickness. De-burr the block in the main web area and in the camshaft cavity to remove all remaining casting flash. Run a bottoming tap down all the threaded holes. Chamfer them slightly also. I like to install hardened cylinder head studs to pick up as much thread enlargement as possible and minimize bore distortion. Keep the amount of overbore to a minimum as the cylinder walls are rather thin. The wall thickness is only about .160 to .178 inches, however the quality of the casting is quite good. I rarely see any evidence of core shift. For compression ratios of 10:1 or higher, install stainless steel o-rings in the block with about .006 inch stick out above the deck. Make sure the o-ring will contact the fire ring on the headgasket. Ultra-radical race motors and turbocharged motors require a metal head gasket made from a sheet of dead soft copper stock. Otherwise use Fel-Pro #8168-PT head gasket. Most serious drag racers use the C6TE-6303-G (3.98 inch stroke) forged steel crankshaft with rod journals ground for the small block Chevrolet bearing sizes (2.100 in). The crank throws are reground to permit a large fillet radius at the corner of the journal. The generous radius reduces the stress concentration in the crankshaft at this point, ensuring longer crankshaft life. Check the crank throws for signs of cracking whenever you have the engine down to inspect or replace the bearings. The number six rod journal fillet radius is where the crankshaft will begin cracking. I have talked with a couple of circle track racers who claim to be using the cast iron 300 inch production crankshaft successfully ("They'll last one season"). But since I can't speak for the kind of power levels these guys are making with their engines I don't want to personally endorse using the cast iron 3.98 inch stroke crank. My plans for a new motor include using a cast iron, heat treated 300 cranksaft. The 240 cast iron crank, on the other hand, is suitable piece to use in a race motor. Because of the additional main-to-rod journal overlap with the short 3.180 inch stroke, there isn't a strength problem with this crank. The crank that is currently in my car is a standard stroke 240 crank that Moldex Tool has ground, balanced, and heat threated. It uses the standard Ford journal sizes and i have over 120 full passes on it. I would also like to point out that a 240 sized motor offers advantages over a 300 incher in any type of racing where you are handicapped on the basis of cubic inches to weight. The port sizes in relationship to the cylinder displacement are more favorable with a 240 than a 300 and also connecting rod angularity is less severe because the 240 has a longer rod with a shorter stroke. For a bracket racer the 300 incher is the way to go. It has more torque for consistent launches and a broad power band that makes this engine very forgiving of a minor driver inconsistencies. Cylinder head preparation is important for pulling good power from any engine. The flow through the head is definitely the most limiting factor in getting any performance out of these engines. Smooth out the sharp corners and enlarge the ports by raising the roof of each port. Cut the exhaust guide back so that it is flush with the roof of the port. Cut the intake guide back .100 inch and install a set of bronze valve guides. I use small block V-8screw-in rocker arm studs after milling and tapping the rocker arm bosses. Ridgeway Racing Associates makes a stud girdle which I use in conjunction with Crane roller rocker arms. (By the way, the 230-250 Chevy six arms also will work and they have a 1.76 ratio versus 1.61 for the Ford. this is a cheap and easy way to pick up about 10% more valve lift on a street machine, too.) Use .194 inch diameter TRW intake valves (#V235IN) and 1.60 diameter exhaust valves (#S2469) with a 30 degree back cut on the intake valves and a good 30 degree-45 degree-60 degree valve job on the valve seat. Open up the combustion chamber around the valves out to the cylinder wall to promote breathing. The combustion chamber should hold 70cc when complete. I also replace the 5/16 inch diameter pushrods with 3/8 inch Clifford Research pushrods. Doing this necessitates enlarging the pushrod guide slots in the head to .380-.385 inch. When you do this keep in mind that the pushrods are slightly angled toward each other and the top of the guide slots are further apart that the rocker arm studs. As a final step to ensure good sealing. I resurfaced the deck and install six head post studs through the top of the cylinder head. These studs bear against the quench area of the combustion chamber roof and minimize chamber flexing. Four of the six studs are fairly easy to install because you can use the existing threaded 3/4-14 core plug holes in the top of the head for installing four center plugs. The two end studs must be installed by spotfacing the top of the head and drilling and tapping the head surface itself. use sealer on these studs to prevent water leaks. All of the modifications to the head took about 80 hours of work, but the end result is a trouble free cylinder head. Piston and rod combinations will vary with each application. There are several ways to go here. If you are on a tight budget you can use the stock rods and an aftermarket piston designed for small block Ford or Chevy V-8's. The 240 has the same bore and compression height as 289/302 Ford (4.000 x 1.605 inches) so a forged small block Ford piston will work well in a 240. TRW makes these pistons in both flat top (L245OF) and pop-up (L2249F) design. Fit the pistons with .0045 to .0055 inch skirt clearance. The standard rods can be used in circle track and bracket drag motors after polishing the side beams, replacing the bit end bolts and nuts, and reconditioning the rod journals. A 302 Chevy pop-up piston will work with the 300 crank and early 300 rods if you open up the small end of the rod from the .912 inch Ford pin size to the .927 inch Chevy pin size. The dome of these pistons can be trimmed down by cutting it at a 12 degree angle to match the valve chamber which has been sectioned through the ports. It comes in handy for checking piston to head clearance. My latest 300 inch bracket motor has Bill Miller rods, 6.48 inches long (stock length is 6.21). The big ends are bored for the 2.100 rod journals as mentioned earlier. These rods are hung on TRW pistons (L2370) which have been extensively reworked and lightened. B&B lightweight wrist pins with .095 inch wall thickness have also been fitted. The valve train on these six cylinders is one area that you can save considerable expense compared to building a small block V-8. For example, I don't use titanium valves because they're expensive and I just don't think they buy you any performance in an engine that won't see service over 8000 RPM. When you build one of these sixes for competition always keep in mind that the fact that the cylinder head port size will limit the usable RPM range to around 7900 RPM for the 240 and 7500 RPM for the 300. My 300 inch bracket motor uses a GK flat tappet cam with 108 degree lobe centers .571 inch intake valve lift and .596 exhaust valve lift, GK tappets, Clifford 3/8 inch diameter pushrods, Crane roller rocker arms, and GK 2010 springs installed with 140 pounds of seat pressure against titanium retainers. The 240 inch D/ED engine uses a Crane Hi-Low No Pop roller cam with 108 degree lobe centers, .665 inch intake valve lift and .687 inch exhaust valve lift, Crower roller tappets, Clifford 3/8 inch diameter pushrods, Crane roller rocker arms and titanium retainers working against Lunati valve springs installed with 180 pounds of seat pressure. A Ridgeway stud girdle is used to add stiffness to the upper valve train area. Induction systems are always a source of puzzlement on an inline six cylinder race engine.. Should I use one large centrally located carburetor or several small ones placed near each intake port? Is a common plenum of an isolated runner (IR) system the best? The fact that there are so many systems being marketed suggests that there is no simple answer. My current choice is a 650 or 750 CFM Holley double pumper on an Offenhauser intake. On a street machine a 480 to 600 CFM four barrel with vacuum secondaries will work great with the same Offy manifold. The offy dual port 4V manifold is a good choice for towing and recreational vehicles. These induction systems are simple and give a very good middle to upper RPM performance even in the 240 motor. I have tried using three Holley 650 CFM, three 500 CFM, or three 350 CFM two barrel carbs mounted sideways on an intake manifold with a common plenum chamber but they still haven't run quicker than my tried and true 4V. Headers should be made of 1 3/4 inch O.D. tubing, 36 inches long with 2 1/2 inch O.D. collectors. Primary tubes made from 1 7/8" inch O.D. tubing hurt my E.T.s. Also seal the crankcase and install a Vac-u-pan system tee'd into both collectors. The best oil pan design is one that has plenty of depth from the front to the rear. I make my own oil pans by starting with the mid-sump pickup truck style pan because it has straight vertical three inch high walls running the whole length of the pan. I also make a windage tray from sheet metal and fine mesh windage screen material available from Moroso. If you don't want to fabricate a custom pan then choose the rear sump van style oil pan and the accompanying long oil pump pickup tube. Finally, if you are going to run one of these inline motors in a drag car, here are a few guidelines for setting up your car. use more tire and less gear than you might otherwise choose with a small block V-8 powered car. The reason for this is that you need lots of bite because of the great low end torque one of these engines makes. You also want the car to pull strong right through the lights so big motored bullies can't run you down at the top end of the race course. My roadster uses 11.5 x 33 slicks and a 5.43 gear, but going as low as 4.33 gear with the same setup will only hurt your E.T. a tenth or so. If you are using an automatic transmission, choose a torque converter with a stall speed of about 2000 RPM less than your intended trap speed. My roadster uses a 5500 RPM Coan converter, a Powerglide, and a trans brake. If you run a stick shift car, a wide ratio 4-speed with a low first gear ratio works well. First gear should be at least 2.78:1 or lower. In conclusion, Ford's 240-300 cubic inch inline sixes are packed with performance potential. They run well and last a long time with minimum maintenance. If you like racing mroe than wrenching maybe you have been overlooking the six. Most racers who build one get "hooked" on them as the most logical engine to race.